It is our hope that you find The Well an inviting community, rooted in authentic worship, and teaching based on scripture. We hope that you can walk through our doors and feel confident that we are a community that truly loves the community. 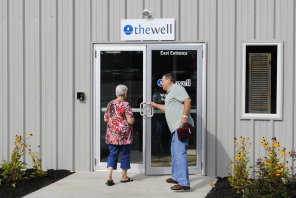 Check out our "New to The Well" page for what to expect on a Sunday morning! ​The Great Commission – Go make disciples, teach, and baptize. …go and make disciples of all nations, baptizing them in the name of the Father and of the Son and of the Holy Spirit, and teaching them to obey everything I have commanded you. The Well is a Biblically - grounded, relational church centered on Jesus Christ, seeking to honor Him with all of our relationships.